A newly revised version of the Linux QL emulator uQLx (uQLx 2017) is now available. Graeme Gregory has “brutalised” (as he puts it on github) the sources to bring them up to date. New binaries are available for 32- and 64-bit x86 systems, as well as ARM (6/7/8). Includes binaries ready to run. Includes documentation from Timothy Swenson to get you started along with a small QXL.win file. The sources are available from my website too in case of difficulty, but I recommend you get them from the github repository to make sure you get the latest sources. This entry was posted in News and tagged uqlx on 20/04/2017 by Dilwyn. Updated sources for XTC68 cross-compiler for QDOS C68 for POSIX systems (e.g. Linux) is available from Jonathan Hudson on github (thanks to Graeme Gregory for the tip). I’ve put a copy of the master zip file onto the C page of my website under XTC68 in case it ever gets removed from github. This entry was posted in News and tagged compiler on 19/04/2017 by Dilwyn. 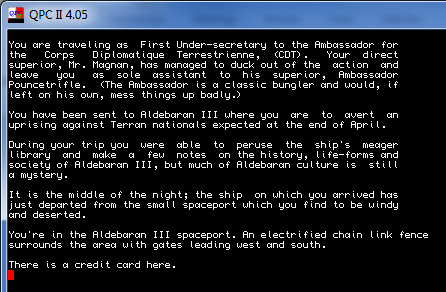 After porting the Colossal Cave adventure game (http://www.dilwyn.me.uk/games/adventures/ccave.zip ) Graeme Gregory has now ported an earlier adventure game system called Wander. Wander is a tool for writing non-deterministic fantasy “stories”. The product is a story whose unfolding is affected by decisions made by the “reader”. Please note that, at the time of writing, the program had an issue with the Signal Extension, which caused it to fail. The program should only be run without the Signal Extension being present. This entry was posted in News and tagged Wander on 17/04/2017 by Dilwyn. This issue includes articles on a new front end program for Digital Precision C, a game called Orbit, array searching, the new release of uQLx and a recently released version of Wander, an original adventure game system for mainframes from the 1970s, one of the earliest adventure games. 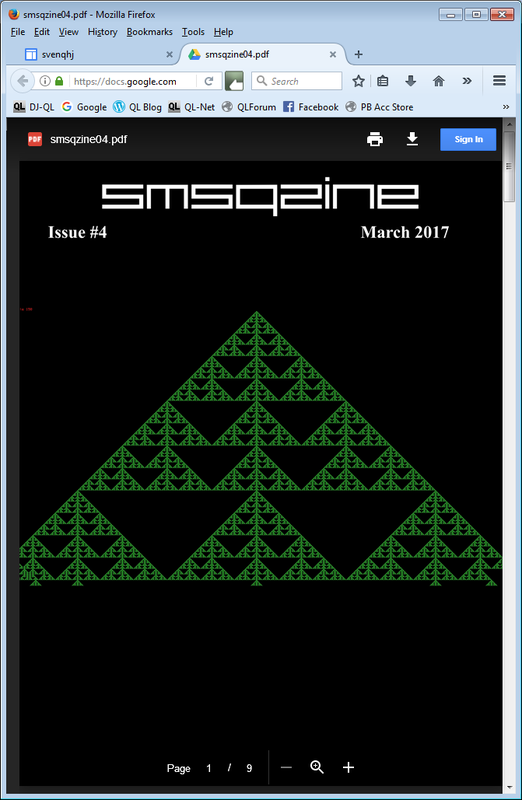 This entry was posted in News and tagged SMSQzine on 16/04/2017 by Dilwyn. This release fixes 3rd slice of mod table, start at $10000 and not $fffc (for QPC2) and links in the floppy module for SMSQmulator, which was broken in v3.29. This entry was posted in News and tagged SMSQ on 14/04/2017 by Dilwyn. It uses the latest version of SMSQ/E and includes some bug fixes and improvements to nfa/sfa drive and keyboard handling. This entry was posted in News and tagged SMSQmulator on 13/04/2017 by Dilwyn. Jan Brdenbeek has re-released MultiMon – a QL Monitor, Disassembler and Debugger written in 1986/7 – on GitHub. It was already available from PD websites, but now there’s an English manual and source files too. MultiMon v2.1 is entirely written in machine code and less than 10K bytes in size. It may be started with an EXEC command or installed via LRESPR as a SuperBASIC extension called MON. This entry was posted in News on 12/04/2017 by Dilwyn. 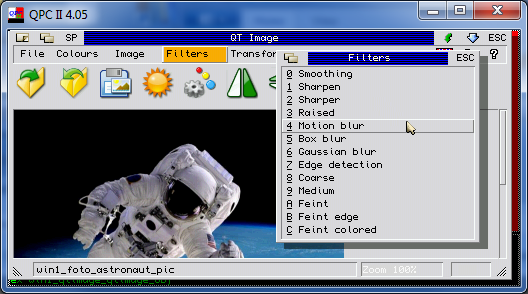 QTImage is a photo editor and viewer for QL-compatible systems and emulators with high colour modes. Based on the David Westbury PHGTK (Photon General Toolkit) software, QTImage by the team at Quantum Technology in Italy allows us to view JPG, GIF and PNG graphics on our GD2 systems. In addition to viewing, it is possible to rotate, flip, resize, zoom, alter brightness and colour levels to improve the pictures. A number of filters can be applied to pictures, such as smoothing, sharpening, raising, motion blur, box blur, Gaussian blur, edge detection, coarsening and feint. Screenshot showing several copies of QTImage running at the same time, all displaying different pictures. The program can be run in English or Italian. This entry was posted in News and tagged QTImage on 11/04/2017 by Dilwyn.